The Signorelli Co. has set opening dates for Valley Ranch Town Center, the largest retail project under construction in the Houston area. The Woodlands-based developer broke ground in April 2014 on the 1.5 million-square-foot mixed-use development, which sits on 240 acres in the north part of Valley Ranch, a 1,400-acre master-planned community north of Kingwood. 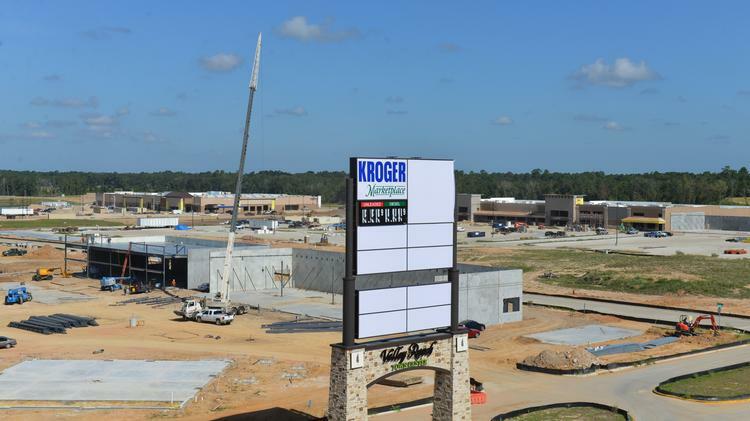 The first phase of Valley Ranch Town Center — spanning 505,000 square feet — is anchored by several major box stores, including Kroger Marketplace, Sam’s Club, Academy Sports + Outdoors and Party City. Academy Sports + Outdoors will be the first store to open in Valley Ranch Town Center, said Danny Signorelli, founder and CEO of Signorelli Co. The Katy-based athletic store is expected to hold a soft opening on Sept. 23 with a grand opening scheduled a week later. Party City’s 12,000-square-foot store is expected to open in early December and Hobby Lobby’s 55,000-square-foot store is expected to open in the first quarter of 2017. The remainder of the major tenants — Kroger Marketplace’s 123,000-square-foot grocery store and Sam’s Club — are expected to open between October and early 2017, Signorelli said. Signorelli Co. is also working to add eight restaurants, including Chili’s, Chick-fil-A, El Pollo Loco and Freebirds, and dozens of specialty retailers in Valley Ranch Town Center’s phase one of development. Valley Ranch Town Center, designed by Houston-based CDA Architects, will ultimately feature more than 120 stores as well as a high-end movie theater, a bowling alley, arcades, a fitness center and several high-class restaurants, such as a steakhouse. The major mixed-use and retail destination will likely further home sales in Valley Ranch, Signorelli said. The developer recently delivered 100 home lots to Legend Homes in its newest neighborhood, Azalea District, and is now moving forward on a 125-acre Valley Ranch Medical District. In the end, Valley Ranch will also transform the sleepy northeast Houston suburb into a regional destination, Signorelli said.